Hopefully yours, Connie: Life with Infertility is Hectic! Life with Infertility is Hectic! Whether your infertility is newly diagnosed or a condition for which you've received long term treatment, "hectic" is likely to be a familiar word in your vocabulary. However, for you, the frustrating aspect of "hectic" is that it is punctuated by periods of waiting -- for test results, for procedures, for consultations, and -- of course-- for a pregnancy. In my book When You're Not Expecting, I refer to this as the period when your life is on hold. So, what's to do when you feel as if you're dancing to the tune of your infertility specialist, clinic schedules and medical procedures? Undoubtedly you will search for ways to lift your spirits, distract yourself from disappointing news, consider new options and nurture your relationships. These are all components of emotional resilience, a familar theme in my blogs. So, given how hectic your life feels, where can you begin to nourish your emotional self? Many women tell me that it is soothing (and takes very little time) to have a ritual just before going to sleep at night and just before getting out of bed in the morning. One comforting ritual is to think of two or three things for which you are grateful; another would be to write briefly in a bedside journal ... perhaps about some positive event that has brought you happiness or that you anticipate with hopefulness. This quiet ritual takes you emotionally to a resilient place in your mind where you tap into feelings of strength. Research cited in my recent blog reminds us that healthy women with low levels of a stress hormone in their saliva conceive in a shorter period of time than their counterparts with higher levels of the stress hormone. So the take away message for any woman trying to conceive is to do what you can to lower your stress. Depending on what appeals to you, think about yoga, meditation, mindfulness, deep breathing, repetitive prayer, muscle relaxation or guided imagery. There also is research evidence cited by Alice Domar saying that alleviating depression and other psychological distress in infertile women appears to make it easier for them to become pregnant. I will address depression in future blogs, but if you believe this is an issue for you, now is a good time to consider seeing a counselor who can help you. In my earlier blogs and in my book I offer suggestions on how to identify a counselor and what you can expect from the counseling experience. If you think you have no time, just remember that lots of your time is spent waiting and feeling stressed. Better to use that time actively pursuing some emotional resilience with a therapist. 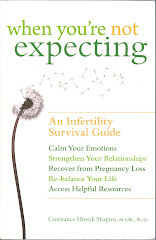 Try to get out of your "infertility rut." This means that you and your partner should spend some time thinking about new experiences. This won't keep you from thinking about your infertility, but it will provide a welcome distraction, and even the anticipation of a new experience can be uplifting. It could be as home-bound as planning a garden and ordering from a seed catalogue or as exotic as an ocean cruise (yes, I know -- you'll have to schedule it around tests and procedures!). You may face the challenge of how to jump from the rut on a low budget, but that can be part of the fun. Remember fun? Now's the time to capture some. Another rut it's easy to fall into is a social rut, where you either quit socializing with friends (perhaps they're either pregnant or new parents) or you find that your friends are so preoccupied with your infertility that you feel as if you have a scarlet "I" on your chest. So figure out what you want to do about your social supports: nourish relationships with friends who are childfree or whose children are grown? tell your current friends that you'll keep them up-to-date if there's any news, but in the mean time encourage more broad topics of conversation than your infertility? join an infertility support group where some members may have achieved their own emotional resilience? take up a new hobby or volunteer experience that will make you feel capable and needed? The sky is the limit here, and any one of these options will broaden your horizons so your preoccupation with infertility is less intense. So even as "hectic" and "waiting" are constant companions in your infertility journey, there are new ways to consider introducing emotional balance into your life. Breathe deeply and move forward!